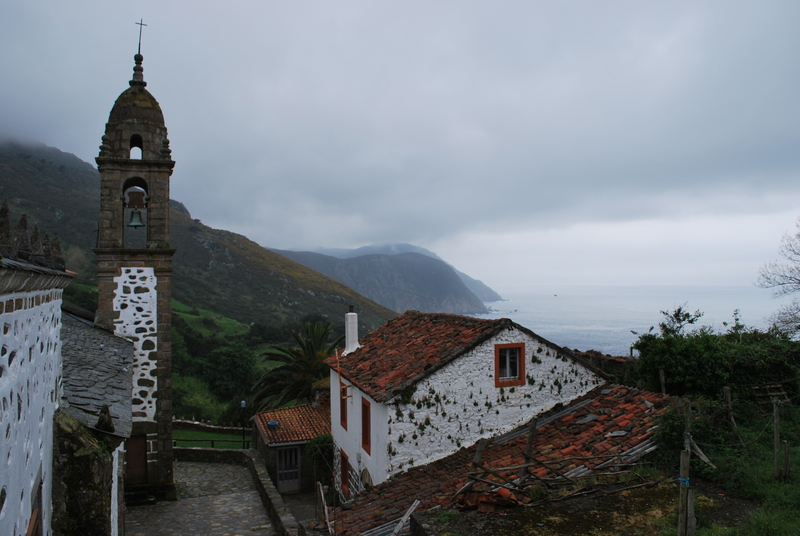 In the municipality of Cedeira (A Coruña), hidden behind forests of lush trees and wild animals, on the edge of huge cliffs overlooking the Atlantic, you will find Santo André de Teixido with its beautiful sanctuary. To get there, it is necessary to ascend the Capelada mountains, passing by roads as beautiful as hard, but worth the effort. Just the views from above deserve it. It is one of the most important places of pilgrimage in Galicia, standing just behind Santiago de Compostela in terms of number of visitors; and is that although its temple dates from century XII, and the preRoman towns worshiped other divinities much earlier. As the famous popular saying goes, “A San Andrés de Teixido vai de morto o que non foi de vivo” (To Santo André de Teixido goes dead who didn’t go alive), and it is imperative to visit the village at least once in the life. According to legend, the Apostle San Andrés, sad because no one was pilgrimage to his sanctuary and how everyone was going to visit the tomb of the Apostle Santiago, complained to God. When he saw him so sad, he promised that no one would ever enter the kingdom of heaven without first passing through his temple, and if he did not do it in his life, he would do it dead. And not only that, but would make him reincarnated in frog, snake or lizard. The origin of the temple itself is also the focus of the legend, since what is said is that San Andrés had overturned in his boat in front of the cliffs of the area becoming a rock, so God decided to grant that sanctuary. It is not surprising that, with this letter of introduction, the place is full of myths and legends of the most varied. From those who say that there is buried a bone of the same saint to those who claim to have crossed some night with the “Santa Compaña”. They say that anyone who goes there must drop a stone in one of the many “milladoiros” along the way and get a bouquet of “herba de namororar” before the end of the visit. But Santo André de Teixido is full of many other traditions, such as that of approaching the source of the Saint and drinking from the three pipes without resting their hands on the fountain. In addition, once this is done, a crumb of bread should be thrown in the water and, if it floats, the desires one asks for come true. Do not worry if you have not brought bread: in the many souvenir shops around the temple you can buy it in figurine form. And here is another myth: these little figures, called “sanandreses”, protect the one who carries them. The truth is that worshiping the dead is not something new here, because throughout the Sierra de A Capelada there are numerous pre-Roman burials dating back thousands of years, and the Celts already thought that here was the door to the afterlife. However, over time, the mystery and magic have been growing to make Santo André de Teixido one of the most curious places in Galicia. A final curiosity: they say that in this area, just above where the sanctuary is located, the Milky Way ends, and that is why it is common in the area to call it “Santo André Road”. Do you dare to come?